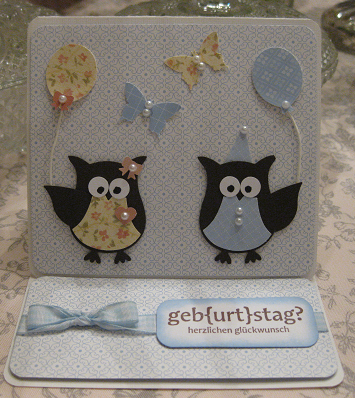 Kellerkind... Beates Paradies: Happy National Scrapbook Day! Okay this is adorable! love love the paper piecing!! and the tiny pearls. So cute! Thanks for playing along in Challenge #2 over at Clearly iStamp. P.S. - there is a world cardmaking day in October too!! There is still time to play in Challenge 1 as it goes till tomorrow at noon. Challenge 3 will be up in about 1.5 hours! Thanks so much for joining us at Penny's Crafty- Creations this week. Such a lovely piece of artwork! Oooh this is soooooo cute. Love those little owls. Thank you for sharing with us at Crafty Ribbons this time.